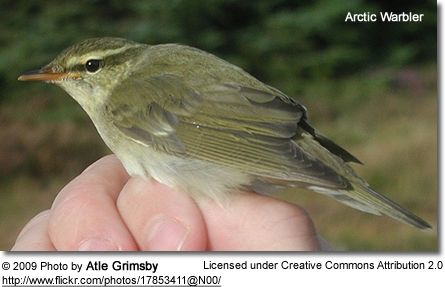 The Arctic Warbler (Phylloscopus borealis, is a widespread leaf warbler. The migratory Arctic Warbler occurs in Fennoscandia and northern Asia and have also established in North America, where they breed in Alaska. They occur in birch or mixed birch forest near water throughout its breeding range. They migrate to southeast Asia for the winter, and has, therefore, the longest migration route of any Old World insectivorous bird. 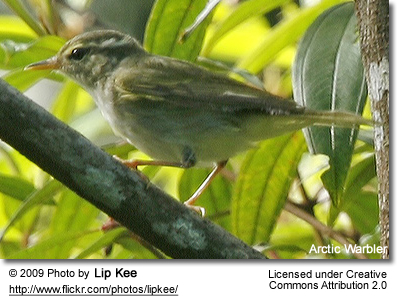 This is a typical leaf warbler in appearance, greyish-green above and off-white below. 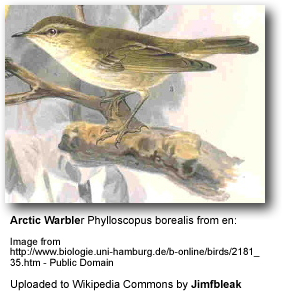 Its single wing bar distinguishes it from most similar species except the Greenish Warbler, Phylloscopus trochiloides. It is larger than that species and has a heavier, dagger-like bill, with a dark tip to the lower beak (mandible). Its song is a fast trill. They occur as autumn vagrants in western Europe and is annual in Great Britain. They nest on the ground in a low shrub. The Arctic Warbers mostly feed on insects.